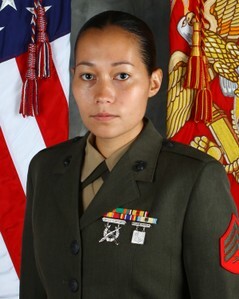 Marine Sergeant Sarah Hakala to Receive Asian Heritage Award for Military Service. Marine Sergeant Sarah Hakala, a mother of two, is only 25 years old, but her impact was immediate when she arrived at Wounded Warrior Battalion West in February 2012. Distinguishing herself as a duty expert, she is frequently sought to develop and complete complex projects. In addition to working long and unusual hours, she demonstrates remarkable initiative and esprit de corps by working outside of business hours to accomplish the mission. For example, Sergeant Hakala dedicated more than 50 off-duty hours to the design, proof and print of over 1,100 official ceremonial brochures and placards, saving the battalion more than $4,200 in production costs. For her exceptional dedication and achievement, she has been selected to receive the 2013 Asian Heritage Award for Military Service during the Tenth Annual Asian Heritage Awards Gala Sept. 14, 2013 at the San Diego Marriott Marquis and Marina, 333 W. Harbor Drive, San Diego. The event will also honor UCSD Chancellor Pradeep Khosla with the Special Recognition Award and 11 others in categories ranging from entrepreneurship to science and technology. Sgt. Hakala’s superior, MSgt Sean P. Sargeant, pointed out how Hakala needs minimal direction and supervision in executing her tasks. “Sergeant Hakala's tireless efforts provide an accurate, real-time representation of battalion operations,” he said. In the past fourteen months, Sergeant Hakala has cataloged, tracked, and updated the commanding officer on nearly 200 national and international events. Sargeant added that “Sergeant Hakala demonstrates the core values of honor, courage, and commitment in the highest fashion.” Her maturity and dependability, coupled with her problem solving and reasoning skills, have proven invaluable to battalion. Whether she is gathering or presenting information to senior battalion staff, she exudes the confidence and clarity expected of a Marine NCO. Sergeant Hakala have a unique heritage. Her mother is Korean and her father is French, Scandinavian, and Cherokee Indian. Her parents married while her father was stationed in Korea. Sergeant Hakala enlisted on March 27, 2006 and she has been in the Marine Corps for over seven years. She attended the Logistics Operations School aboard Camp Lejeune, North Carolina, where she earned the MOS 0431 (Logistics Embarkation Specialist). In October of 2006, she reported for duty at Marine Wing Support Squadron 473 at Miramar, California, where she was mobilized in support of Operation Enduring Freedom and served as the Squadron Embarkation Representative. Sgt. Hakala reported to Wounded Warrior Battalion-West February of 2012 and is currently serving as the S-3 Current Operations Chief. Marine Sgt. Sarah Hakala from Rosalynn Carmen on Vimeo.